Hyundai does not have a premium brand separate from its main brand. What it came up to make its 2013 Equus customers enjoy thier vehicle is very interesting. 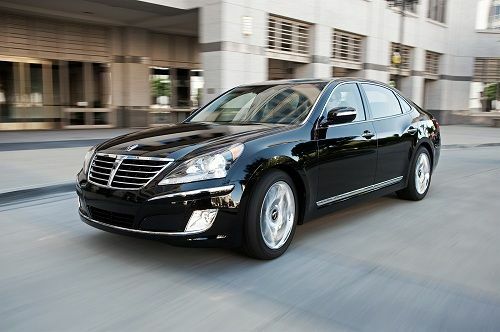 Hyunda’s 2013 Equus is a tremendous automobile and is competitive with the world’s best executive sedans. It has everything a car of its class should have, and can compete with the Lexus LS, the Mercedes E-class, and similar models from Cadillac, Audi, and Infiniti. However, there is one thing that Hyundai does not have, and never had, that many of the premium automakers such as Lexus, Cadillac, and Audi have always had. It does not have premium dealerships to showcase its top models. That has proven to be a huge problem for Hyundai, and also may be exactly what eventually launches it past these brands. Over the past 5 years the premium automakers have made significant changes to the way they treat customers who visit their dealership facilities. Lexus has gone to the extremes at its dealerships. Free cafes for customers and also free car washes at any time are now becoming the norm. White glove treatment by valets who open doors for customers inside massive drive-in drop off bays, then offer to get them a cup of coffee as they are led to their personal service advisor are amenities that are now expected. Cadillac has employed outside agencies that specialize in high net wealth individuals shopping habits to try to determine how it can create a whole experience around the interaction its customers have with the brand and its people and its dealerships. Although, in a recent press release Cadillac still had self-serve coffee makers and stark waiting areas in its photos. Hyundai has only its main dealerships and they tend not to be fancy. Since the investment to create a whole new brand may never pay off for Hyundai, and since it would only then be keeping up with the other brands who offer similar cars, Hyundai had to find a way to provide customers for its top model an experience that they might prefer over these formidable, established, premium brand dealerships. Frankly speaking, people paying over $60,000 for a premium sedan may not want to visit a dealership that is serving the needs of lines of customers with old, beat up, economy cars. What Hyundai came up with is simple. Never have the customer visit the dealership for any reason. Hyundai has set up a plan whereby buyers considering a Hyundai Equus will have what it calls in a recent press release, a “Your Time, Your Place.” experience. Hyundai will deliver to the prospective buyer’s home a new Equus. A Product Champion, specifically trained to highlight the Equus and interact with its shoppers, will help the customer enjoy a personalized shopping experience. Owners of the Equus can also then opt to have their vehicle picked up anyplace the choose when service is required and the Hyundai dealership will leave the customer with a loaner car. Once the service is complete, the customer can advise the dealership where to drop their vehicle and retrieve the loaner. Hyundai’s products have become competitive with the best in the world, and now their dealership experience may have as well. Yes! Finally something about smokeless ciffee roaster.